Forty years of stubbornness down the drain. Lemongrass is proving me wrong right and left. This month’s product focus is on Lemongrass Spa’s Make Up Primer. Eventually you will get used to me saying I don’t like “systems” and I’m not a “foofy girly girl.” I will stand strong on the Girly-Girl thing because even in high school I was never a Between-Class-Run-To-Bathroom-Fix-My-Makeup kind of girl. As proof, I have attached a picture which is an excerpt from our HS Senior Class Photo. That’s how I regularly dressed: sweatshirt, jeans, and for some reason – white socks with black shoes (yeah I cropped those out). 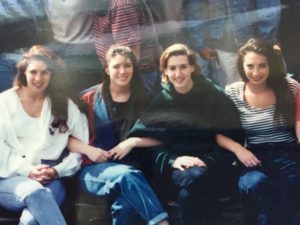 I will freely admit that I FORGOT the picture was being taken that day (and why my friends are ultra cute); but I remember saying in my defense, “This is me.” See how that works, twenty+ years later I have it as hard evidence of my lack of Foof. I couldn’t have planned it better. Now, what does go hand-in-hand with Fooflessness is the fact that I don’t like to (and frankly won’t) re-apply make up during the day. Lip gloss is the only exception. The purpose of Make Up Primer is to create a smooth canvas for your make up to go on evenly and give it something to hold on to. Lemongrass Spa’s Primer has a very satin-like feel and the rest of my make up did go on very nicely. Everything looked pretty flawless. What surprised me, was that the first day I wore it the temperature was about 90 degrees and it was quite humid. I had done a few massages and ran some errands. I had a dinner that evening with my sister and some friends so I went to touch up the make-up. But. I. Didn’t. Have. To. I cleaned up a little under my eyes, but that was all I had to do. Everything stayed put. I was sold. Especially in the summer heat of South Florida. If you’re decades ahead of me and already use a make up primer, kudos to you! Do me a favor, and check the ingredients in your favorite products. Lemongrass Spa’s Make Up Primer is made from the following natural ingredients: Organic Aloe Barbadensis Leaf (Aloe Gel)*, Simmondsia Chinensis (Jojoba) Seed Oil*, Jojoba Wax Esters, Oryza Sativa (Rice) Starch*, Tocopherol (Vitamin E), Sodium Ascorbate (Vitamin C), Euphorbia Cerifera (Candelilla) Wax, Extracts of Organic Camelia Sinensis Leaf Ferment (Green Tea), Resveratrol, Silica, Lonicera Caprifolium (Japanese Honeysuckle), Persea Gratissima Oil (Avocado Butter)*, Mica, Phenoxyethanol (preservative less than 1%). *Certified organic. All Lemongrass products can be purchased on my site at www.OurLemongrassSpa.com/SimplyMassage. I’m always available to answer any questions or help you place an order! Memorial Day has just passed; a day we celebrate those who have given their lives to keep our country free. Both of my grandfathers served in the Armed Forces (Air Force and Navy), my father served in the Navy, and my husband served in the Army (both in Vietnam). I’m fortunate and grateful that they all survived their wars and while my maternal grandfather passed several years ago, the other three men are all happily part of my life. So many men and women are still selflessly sacrificing their lives to support our freedoms. I’m proud that Lemongrass Spa has found a way to lend their support to our troops. 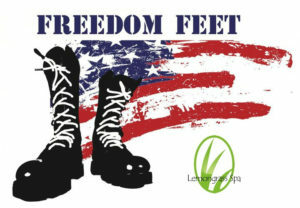 Lemongrass Spa has kicked off their 9th Annual Freedom Feet Campaign. Our home office gets the addresses of units where our service members (men and women) are deployed overseas. As people submit orders for kits we ship them in groups of at least ten to the units. It’s a wonderful, pampering surprise package that they appreciate so much, especially because they wear combat boots for 18 hours a day. Lemongrass Spa Home Office donates one Freedom Feet Foot Kit for every 10 kits sponsored. To further support the cause, I will also personally donate one kit for every 10 kits purchased directly through my site (www.OurLemongrassSpa.com/SimplyMassage). The Freedom Feet Foot Kit (say that three times fast) is a smaller version of our popular Cucumber Foot Kit and includes a jar of foot soak, foot scrub, and foot creme in a gift box. If you’d like to participate in this year’s campaign (ends July 31), you may shop Lemongrass Spa and search “Freedom Feet” under “Shop Our Products.” The kit is reasonably priced at $24 which includes tax, shipping and handling. As always, I’m happy to help with any order. There is even an option to make a donation towards the cause in $1 increments in any amount you choose. Approximately how many people in unit. We try to send enough kits for each person in the unit. Approximately how long unit will be stationed at address. *We realize this information is not always available but ask for it to help ensure kits are sent to service members before deployment ends. Thank you to all of our troops for all you do to protect our country! 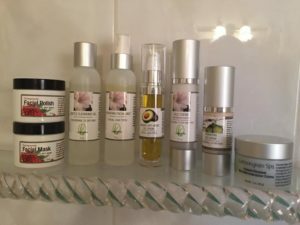 As promised, here is my review of the Lemongrass Spa Face Care System. 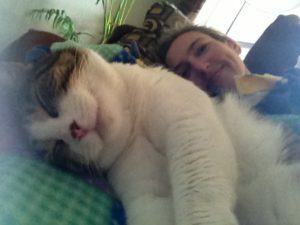 I have said it before and I will say it again (many times over): I am not a foofy girl. I am a low maintenance, little make-up, ponytail sporting, non-foofy girl. I’ve also never been a “systems” girl. Every cosmetics company wants you to use their “system.” Yes, I have cleansers, deep cleansers, toners, lotions, cremes, and exfoliants galore. I have purchased very expensive items and I have made my own. But I’ve always used varied brands and I switched around a lot. About my skin: I have very dry skin and small pores. I can break out with a change of products, weather, and life events. My last year in Texas I battled with continuous break-outs and once I moved to Florida it cleared up. It could have been stress related, but I will say my skin LOVES Florida humidity. If I change products, I typically change one item at a time. That way if a breakout occurs, I know who the culprit is. I will admit, I kind of jumped in on the face care system with only a day or two in between adding products. Cleansing and moisturizing: My first switch was to the Gentle Cleansing Gel for Normal to Dry Skin. I wash my face in the shower in the morning and I only need a pea sized amount, lathered in my hands to do the job. The label says it removes make-up (I never believe this – I always exit the shower looking like a raccoon), but this cleanser actually does. I take the time to gently massage my eyelids and lashes, but it cleans it all remarkably well without burning my eyes. Step 2: Hydrating Facial Mist – the Lemongrass version of toner. I pick up on the scent of the witch hazel, but it’s nothing that bothers me or lingers. This was actually one of the last products I added to my routine since I was never a regular toner user. Now I use it every day. Step 3: Organic Anti-Aging Oil Serum. I love this stuff. Again, you don’t have to use a lot. I use about a 1/2 pump of the product. The cleansing gel and facial mist leave my skin with a clean but slightly “tight” feel and the oil softens everything up. Step 4: Face Creme for Normal to Dry Skin. Again, a little goes a long way. It has a really nice texture and feels very hydrating on the face. This whole routine takes me less than 2 minutes. While I’m applying my products, I use the Tanaka Face Self Massage techniques. A friend of mine knows an esthetician who told her about this routine. I don’t do the entire ten minute routine, but I figure every little bit helps?? I have had zero break-outs with the new products, I don’t have to use a ton of product, and my skin has been feeling really nice. After switching over to all of the cleansing products with positive results, I tried out the Hydrating Eye Creme. I found it works best for me at night. I need to practice with it a little more when using it with make-up because I felt like it made my make-up run. I also may have been applying it in the wrong order or using too much. Exfoliation: I have used the Face Polish for Normal to Dry Skin twice now and I really like it. Directions say to apply with a brush, but I use my fingers and the Tanaka Face Self Massage techniques. The beads remind me of tapioca, and the pomegranate scent is refreshing but not overpowering. The Face Polish also comes in unscented if you are sensitive to scents, or just don’t like the pomegranate (Note: the polish and mask for oily or blemished skin have different ingredients and scents that I haven’t tried). I have also tried the Instant Renewal Microdermabrasion Creme. Yeah. That’s good stuff. It is pretty serious – I couldn’t massage it around for the full two minutes (directions say “up to two minutes”). I was a little afraid my skin would be a terrible red mess, but it was fine. Not red. Nice and smooth. Again, you don’t need to use a lot of the product. I plan on increasing my use to see if it will soften some of the sun spots my 41 years on Earth have bestowed upon me. Hydration: I have used the Facial Mask for Normal to Dry skin types twice as well. Both times I used it after the Facial Polish. It’s a creamy mask, kind of clay-like in color and texture, and it doesn’t dry on your skin. Both times I used it, my husband walked in the bathroom and screamed in an overly dramatic fashion. I told him he should be doing the facial mask too and he responded with, “I don’t have any wrinkles.” Yeah, there isn’t much rationalizing to be done with that argument, is there? Again, great results. No break-outs. Hydrated skin. Two thumbs up. I have been on this regimen for over a month now and still positive results. I like the packaging of the products: I don’t mind keeping them on my counter. I love the natural and organic aspect of the products. Finally, I don’t think about my skin. It’s not dry and itchy, it’s not oily feeling, it’s just nice and comfortable. Isn’t that all we want? To be comfortable in our own skin? My final vote of confidence: I have tossed all of my other products. I don’t need them. Lemongrass sells all of the skin care products separately, so you can replenish your stock as needed (oh, another thing I like is that the lotion pumps from the bottom, so you get to use ALL of it!). They also sell them in kits to help get you started (you get a little discount on the kits! ): OurLemongrassSpa.com/SimplyMassage. Have questions? Need help? I’m just a mouse click or phone call away! Next up: A review of the Lemongrass make-up products. I am not a big skin care, make-up, foofy kinda girl. I’m just not. Never have been. I like my products to be effective and now that I’ve been listening more and learning more, I’m discovering how important it is for our skin products to be safe. Our skin is our largest organ (we carry about 8lbs of it) and we know we absorb products through our skin. We have become increasingly aware of what we put in our bodies (don’t make me break out my GMO soapbox), but what about what we put ON our bodies? Chemicals have been attributed to breast cancer and the onset of early puberty in children. Here is an informative article published by Breast Cancer Fund and includes multiple links about chemicals in our food, plastics, cosmetics, etc. 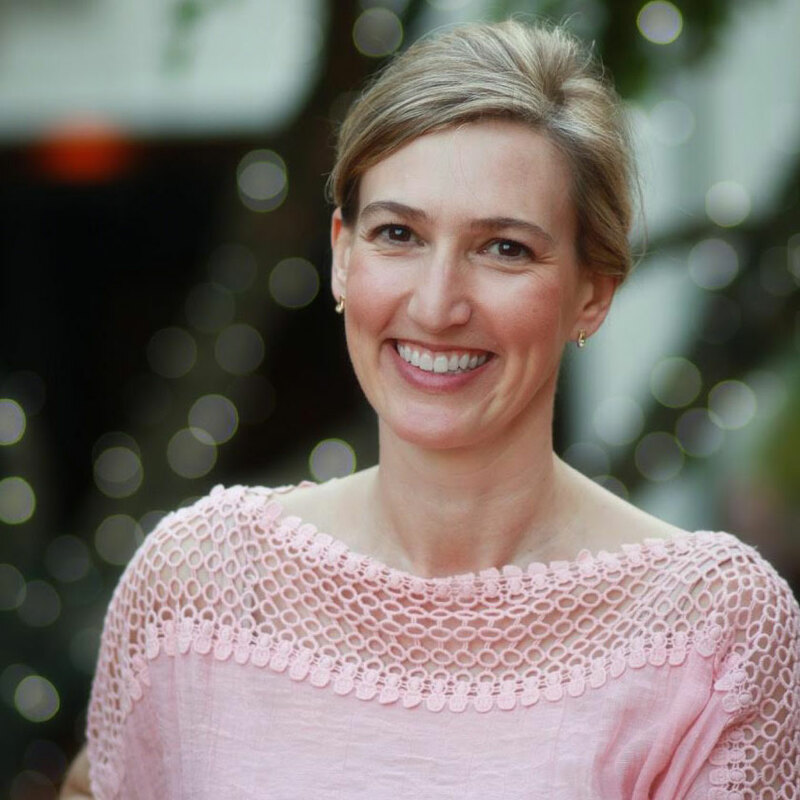 Breast Cancer & Our Environment. I’ve had my ear to the ground about the cosmetics issue for some time now. Recently I was introduced to Lemongrass Spa Products. I tried some of their products and about 30 days later I decided to rep for them. I. Love. Their. Stuff. I have been known to make my own scrubs, soaks, and facial masks, but let’s get real. I don’t have the time. I’m not even a MOM (I don’t know how y’all do it). By the time I buy all the stuff, I’ve spent a fortune. I don’t have the room to store everything, and I generally make a big a$$ mess. These products are all handmade in Colorado. The scrubs are just like what I’d make at home – but lots of great scents. Yes, I’ve made my own lotion out of coconut oil too (did I already mention the big a$$ mess?). My Lemongrass starter kit came with samples of nine different lotion scents: from lavender vanilla to grapefruit lily. There’s a men’s line and a line for Baby. Insect repellents and sunscreen for kiddos. Hate all scents? They have UNSCENTED. They have Vegan, Gluten Free… so many great options. Added bonus: the prices are actually reasonable. I’ve already switched all of my face care and body care and I’m just delving into the make-up. I’ll say right now that their BB Creme is like a little veil of velvet for your face. I’ll be peppering my blog with honest reviews of their products. First up will be the facial cleansing system. I’d like to try hosting a Facebook Party (yeah – that’s a thing – with a Live Feed and everything). So let me know what topics you’re interested in and I’ll figure out how the camera thingy on my computer works. In the meantime, check out the Spring – Summer Catalog 2016. Several of my Florida massage clients are already enjoying these products, but another thing I love is that I can share these products with everyone, no matter where you hang your hat. If you want to try any products we have a 60 day return policy (doesn’t cover shipping though). You also get the added bonus of having little old me as your personal representative to answer any questions you may have!